Just like any other type of cookie or bar cookie, brownies are an incredibly versatile treat, even though their name usually brings to mind just one image of a rich, fudgy bar. 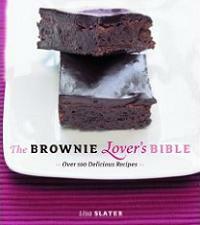 The Brownie Lover’s Bible is dedicated to all kinds of different brownie recipes, all with different and equally mouthwatering photos of the recipes. It might even convert a few people to being brownie-lovers after flipping through the pages, before even making any of the recipes! That said, it’s probably a good thing that the recipes are written in a clear and easy-to-follow way. They aren’t difficult to put together and the waiting time is mostly in the cooling of the finished products, not in difficult prep work. This means that it doesn’t take long before you’re eating the fruits (or chocolates) of your labors with this book. The book is broken down into sections based on different types of brownies, and includes everything from classic fudgy brownies, to gluten free brownies to brownie pie and ice cream-like frozen brownie hot chocolate. If you don’t make any of the recipes, you’ll still walk away with lots of ideas for new flavors and ingredients to add to some of your other favorite brownie recipes. I just love how many cookbooks, dedicated to one type of baked good are coming out of the woodwork. I must have a look at this one. Thanks. Brownies are one of my favorites. I’ll get this book. I think this is a great idea, because brownies really do have so many different varieties… sometimes you just don’t think of it that way. I love brownies and I need to give this a look. I love gooey brownies best, especially if they have some type of caramel and nuts. Mmm… now I want one. Can anyone tell me if there are photos to every recipe?